SQL Server 2017 brings the performance and security of SQL Server to Linux and Docker containers. SQL Server 2017 delivers mission critical OLTP database capabilities and enterprise data warehousing with in-memory technology across workloads. Customers will gain transformative insights from in-database machine learning with Python and R, plus rich interactive reporting on any device for faster decision making. Developers can choose their language and platform while container support seamlessly facilitates DevOps scenarios. SQL Server 2017 on Linux: SQL Server 2017 now supports deployment on RedHat Enterprise Linux (RHEL), Ubuntu, and SUSE Linux Enterprise Server (SLES). The SQL Server 2017 SKUs are platform agnostic, so customers can run the software on either Windows or Linux. SQL Server 2017 is also available in free Developer and Express editions. Web Edition is offered in the Services Provider License Agreement (SPLA) program only. – Each server running SQL Server software requires a server license. 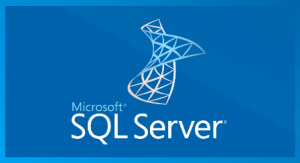 – Each user and/or device accessing a licensed SQL Server requires a SQL Server CAL that is the same version or newer – for example, to access a SQL Server 2012 Standard Edition server, a user would need a SQL Server 2012 or 2017 CAL. – Each SQL Server CAL allows access to multiple licensed SQL Servers, including Standard Edition and legacy Business Intelligence and Enterprise Edition Servers. – Core based licensing is appropriate when customers are unable to count users/devices, have Internet/Extranet workloads or systems that integrate with external facing workloads. – To license a physical server—when running SQL Server in a physical OSE—all physical cores on the server must be licensed. – A minimum of four core licenses are required for each physical processor on the server. Special note for Enterprise Edition users: With the introduction of SQL Server 2012, Enterprise Edition was removed from the Server + CAL model and new server licenses are no longer available. 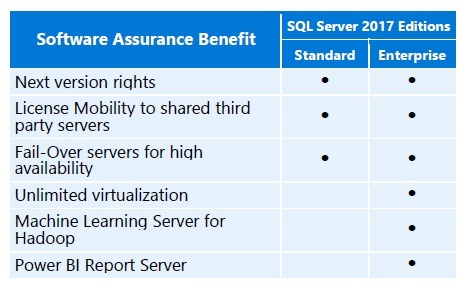 However, customers who have maintained Software Assurance (SA) coverage can continue to renew SA on Enterprise Edition servers and upgrade to SQL Server 2017 software. Note: when upgrading to SQL Server 2017, a 20-core limit applies to the software. SQL Server 2017 offers use rights for virtual machines and containers, to provide flexibility for customers’ deployments. 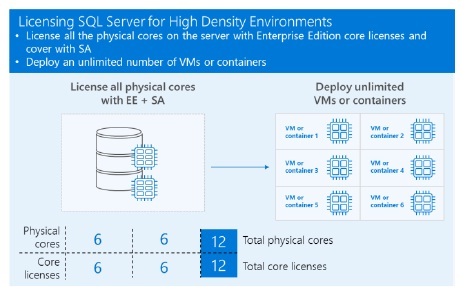 There are two primary licensing options for virtual machines and containers in SQL Server 2017 – the ability to license individual virtual machines and containers and the ability to license for maximum densities in highly virtualized or high-density container environments. As hardware capabilities grow, it continues to be more common for each database to use a fraction of its server’s computing power. When deploying databases on Virtual Machines (VMs) or containers that use just a fraction of a physical server, savings can be achieved by licensing individual VMs or containers. 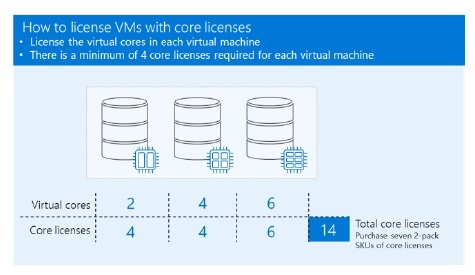 To license a VM or container with core licenses, purchase a core license for each virtual core (virtual thread) allocated to the VM or the number of cores configured for access by the container (with a minimum of 4 core licenses per VM or container). 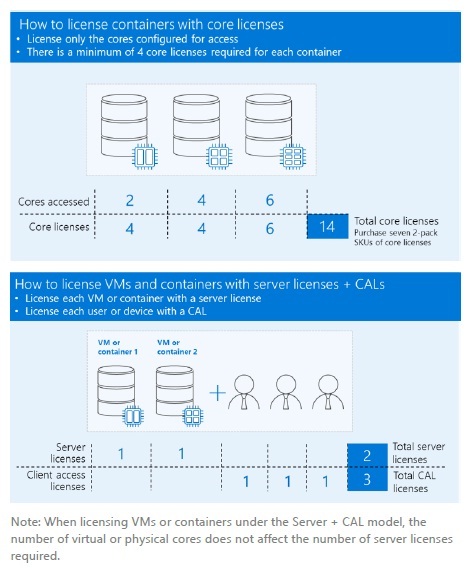 • To license a single VM or container with a server license (for Standard Edition only), purchase a server license for each VM or container, and a CAL for each user or device. • Each licensed VM or container covered with SA can be moved frequently within a server farm, or to a third-party hoster or cloud services provider, without the need to purchase additional SQL Server licenses. Further savings can be achieved by licensing SQL Server high density VM or container deployments. This is a great option for customers who want to take advantage of the full computing power of their physical servers and have very dynamic provisioning and de-provisioning of virtual resources or container images. • Customers can deploy an unlimited number of VMs or containers on the server and utilize the full capacity of the licensed hardware, by fully licensing the server (or server farm) with Enterprise Edition core licenses and SA coverage based on the total number of physical cores on the servers. • SA enables the ability to run an unlimited number of virtual machines or containers to handle dynamic workloads and fully utilize the hardware’s computing power. SQL Server software can be configured so that if one server fails, its processing will be picked up, recovered and continued by another server. Each active server licensed with SA coverage allows the installation of a single passive server used for fail-over support. workloads, or performing any “work” such as additional backups from secondary servers, then it must be separately licensed for SQL Server. • The server running the active replica must be licensed for SQL Server and covered with SA. of compute as the primary replica. and capabilities of Enterprise Edition—licensed for development, test and demonstration purposes only.